Inder Loves Folk Art: Handmade Christmas - Status Report. Hello, friends! I hope you had a wonderful Christmas (if you celebrate)! Ours was quiet and idyllic. We spent time with friends and family and the kids got some loot. Perfect. I finished one handmade gift. A classic flannel nightgown for my niece Helen, using an old pattern that my aunt included in a box full of goodies she sent me recently. From the looks of the pattern, she made both nightgowns and robes for my cousins back in the day. Everything was perfectly cut out and folded back into the envelope. This bee-printed flannel has been sitting in my stash for several years, and turned out to be just enough for this pattern, score! I was so happy to have a working sewing machine again - this went together so quickly and easily and I am back in my happy place, sewing-wise! I opted to use rick-rack on the yoke and pocket instead of eyelet lace. The little offset pocket is so cute. This nightgown reminds me of the nightgowns the girls wear in the book Polar Express, so I figured I'd include the book as part of Helen's gift. A nightgown, all by itself, isn't a very exciting gift, and I am eager to maintain my "cool Auntie" status. 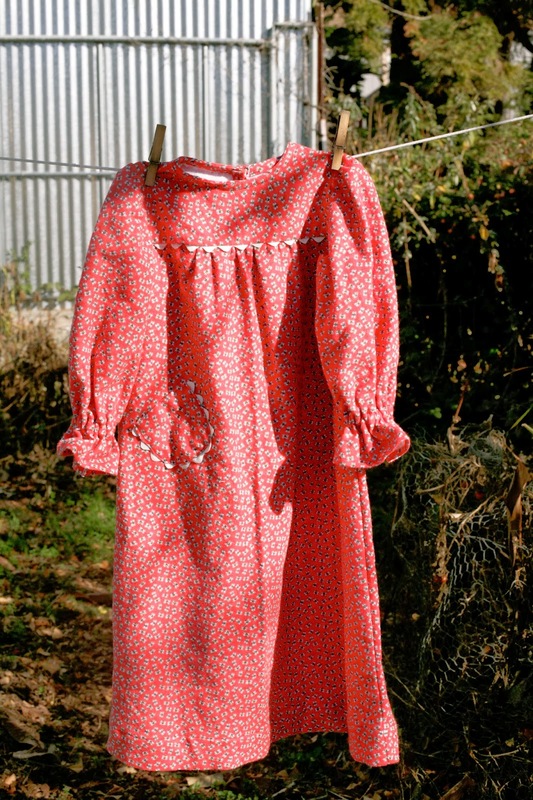 Hey, I just realized - I got this pattern from my auntie, and Helen gets the nightgown made with the pattern from her auntie. It's like the auntie-chain-of-love. I am also working on a handmade Christmas item for my kiddos: a brother for Maggie Rabbit, using Alicia Paulson's pattern. 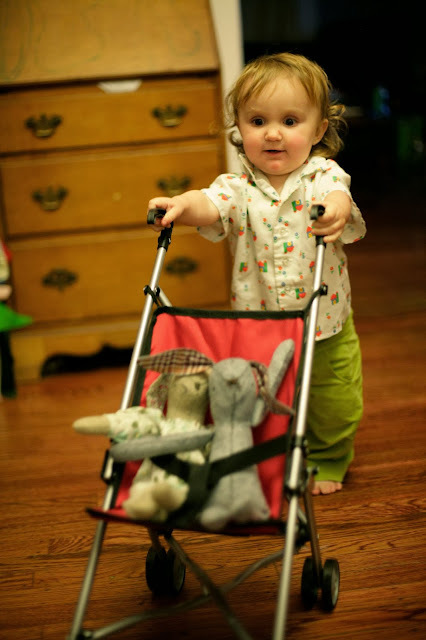 I didn't finish sewing Brother Bunny together until last night, and I haven't made him any clothing yet, but Maggie took to him right away, pushing him around (with his sister) in her new doll stroller (a Christmas present from her auntie, my little sister). 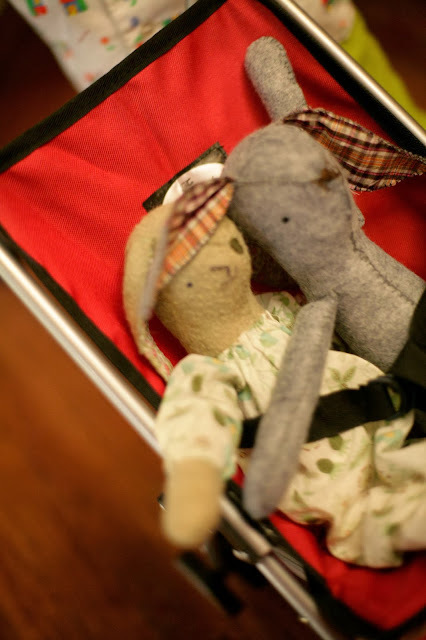 Brother Bunny is made from gray wool felt and has plaid ears. I'm going to make him a pair of jeans and a button down shirt using this pattern. Yay! I'm glad that your sewing machine is back in working order. The nightgown is adorable and makes a perfect Christmas gift. :) I didn't know Alicia is working on more softies...I'll have to check it out. I love everything she makes! The bunnies are so cute! My daughter's Maggie is also cape-less as I just can't seem to motivate myself to learn to knit even though I went out and bought knitting needles right away...Have you seen the yoked cardigans Alicia makes? It would be crazy if you _didn't_ learn to knit to make a bunny sweater.